Wouldya believe that StarWarsShop.com is now selling the Darth Vader Toaster? 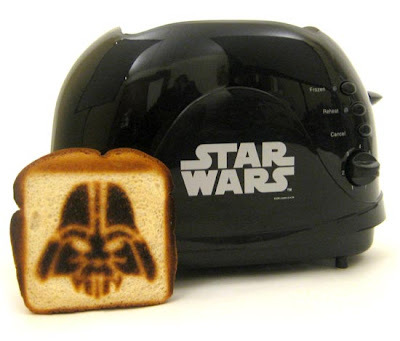 For $54.99 you can have this kitchen appliance, which burns the evil visage of that most famous Dark Lord of the Sith into the surface of a slice of bread. Kinda sick, when you think about how the living remnant of what was once Anakin Skywalker is so charred and roasted under that black armor.